#1 Say NO to Posho! Last week I attended four meetings in Kigoma in my capacity (and as part of my job, which people elected me to do) as MP of Kigoma Kaskazini. I attended meetings at the Constituency Development Fund Committee, District Council, Road Board and Regional Consultative (RCC). In all of these meetings participants are ‘entitled’ to receive posho (sitting allowance). In keeping with my stand I said NO to the posho. However, I signed for it and took it – in order then to go round the technicality of returning back the posho to the Government to show that my statement is not just rhetoric but action. We have to walk the talk. 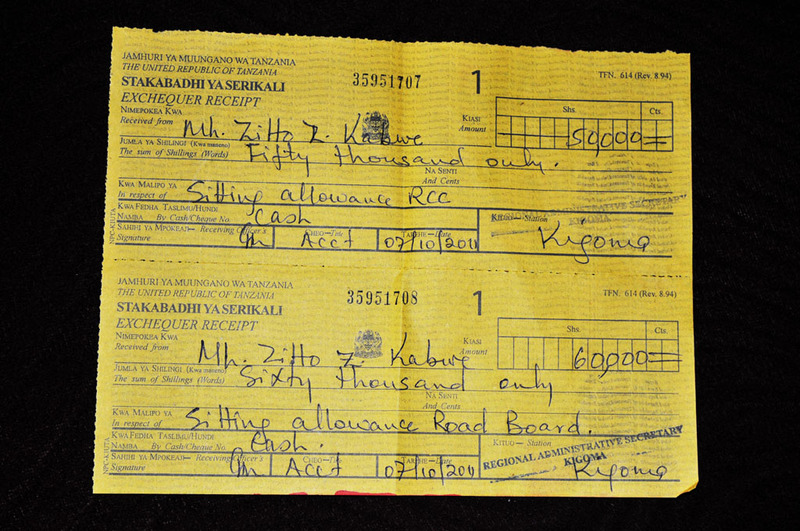 Above photo illustrates the receipt showing the payment I made back to the Government for the Road Board meeting. Let’s cut down on unnecessary expenditure and direct this money to our development budget to spur development and growth. Please, do also read Policy Forum’s report ‘Why we must abolish ‘sitting allowance’.